Today’s business cycles have sped up, our decision cycle must match! In order to win we should operate at a faster tempo or rhythm or, better yet, operate inside adversary’s Observation-Orientation-Decision-Action [OODA] time cycle or loop. Colonel John Boyd’s competitive strategy, the OODA Loop (Observation-Orientation-Decision-Action), is taught and used throughout the military. Today, it has an equally important role to play in the business world. If we don’t execute our decision at pace that business needed, the decision becomes less effective and bottleneck to the business. Also, executing of decisions (operational business decisions) must provide high-quality and consistent results continuously. Therefore the success of business highly relies on the quality and speed of the operational decisions. It means we must be able to make faster, smarter decisions, which are continuously adapted to meet today’s demanding, changing business world. Complicating this is the challenge of the Smart Device, SaaS driven application explosion leading to operational data being spread far and wide. • Real time Dashboards (or other data sources) provide Observations. • Data Analytics assist with Orientation and algorithms for Decisions. • And the whole Action is simply missing and left out for coding applications etc. 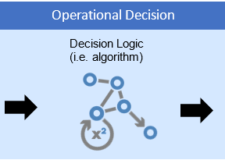 Traditional approach in business in automation of decision is causing a disconnected decision experience and leads to less-effective decisions and bottleneck in adapting decisions automation, Until now! FlexRule provides the operational decisions automation platform supporting all stages of OODA Loop to speed up your decision cycle, giving your organisation a competitive advantage to win in the market and to fight off disrupters. FlexRule’s operational decision automation approach (decision centric approach) is based on OODA loop’s decision framework empowering organisations explain and model how decisions are made and carried out with supporting the 4 stages of the cycle. Observe: Look for triggers, external and internal business events. Connect to relevant data sources (i.e. database, files, services, etc.). Orient: Builds context for decision execution. 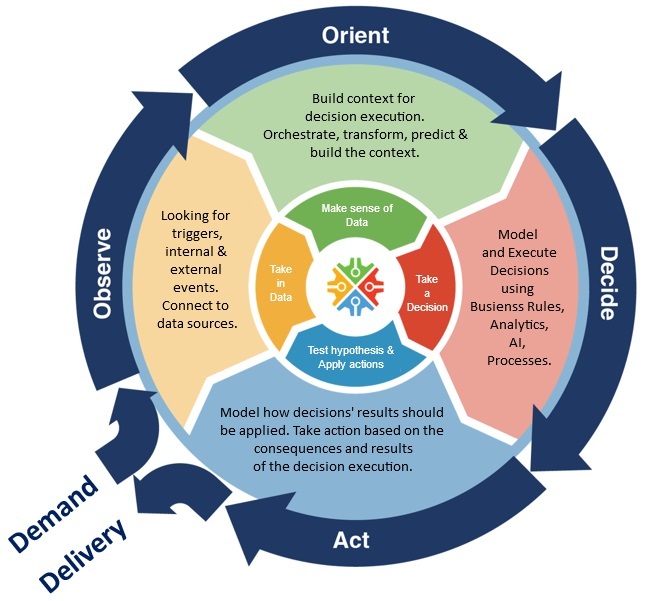 Orchestrate, transform, predict and build the decision’s context. 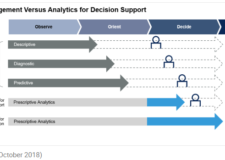 Decide: is about modeling, executing decision, deploy and execute decision models based on business decisions, rules, analytics and AI or other technologies. Act: once the decision is reached, apply the consequences and result of decisions made. Therefore, it is no coincidence that FlexRule is being used for terrorist screening, anti-money laundering, industry disruption, audit platform, healthcare compliance and more. In some of these examples, having a decision cycle faster than the competition can literally mean life or death. Often FlexRule customers start implementing just one of the four stages of the OODA Loop, such as Decision Automation, and quickly realize there is much greater competitive advantage and business value to be gained by leveraging all of FlexRule’s platform capabilities. Our customers have implemented their OODA Loop strategies to speed up their decision cycle and gain a very strong competitive position. The question is do we want this powerful advantage working for us, or against us? 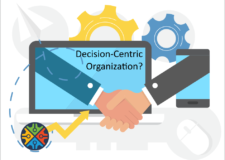 Here is more details how the decision-centric approach in automation can help you and giving your competitive edge. Operate inside the enemy’s OODA loops or get inside their mind-time-space-as a basis to penetrate the moral-mental-physical being of one’s adversaries in order to pull them apart and bring about their collapse.